There are few people who can say they enjoy cleaning the tiles and grout in the shower. It’s one of those tedious tasks that everyone dreads to tackle. The time-consuming nature of tile and grout cleaning, and the huge effort that is required to even get average results is a pain. The difficulty is not only to get the area looking like new, but to make sure no damage comes to the surface of the tile at the same time. There are many cleaning options to choose from but not all of them are ideal. Visit the cleaning aisle of any supermarket and you’ll see rows upon rows of grout and tile products that claim to give you a superior clean with minimal effort. These products make bold claims but how much of what they promise can be delivered? It’s not often easy to find the right product to safely use in your home. Many of the chemicals in these cleaners can be extremely toxic so it’s always advised to strictly follow the safety instructions. Regardless of the what the label says, you can’t just expect to spray and rinse away the grime. It usually requires a few hours of serious elbow grease to make a dent on those stubborn stains. There are many natural solutions that work just as well as their expensive cousins that you can make at home. First, you’ll want to open some doors and windows to make sure the area is well ventilated when using bleach, and be sure to always wear protective gloves. One capful of bleach to one bucket of water. Thoroughly mop the area first with the bleach solution and then put on some rubber gloves and scrub with a dry cloth. You may want to let the bleach set into the grout lines for a few hours before attempting to tackle those stains. Wipe the area with baking soda and water to remove the chlorine smell at the end. 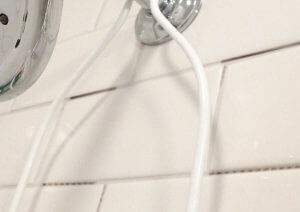 Create a thick paste of baking soda and water to spread over the grout lines. Once that’s had a chance to settle in simply spray with vinegar from your cupboard and scrub with a firm bristled brush. Again, be sure to wear thick gloves and then mix together the baking soda and a very small amount bleach into a paste and carefully spread it onto the tile grout lines. Try not to get this mixture onto dark tiles as it can stain. Wait 10 minutes before giving the area a good scrub and finally wipe with a damp cloth. You’ll want to be careful not to damage either the tiles or grout by leaving solutions on too long or using too much pressure as you scrub. Always remember that products like bleach and hydrogen peroxide, in particular, have the potential to cause harm if proper safety precautions are not followed. By far the easiest and most effective solution to tackle those dull and lifeless tiles is to call in the experts. Years of experience and knowledge of safe products and specialised cleaning tools will always give you a superior tile and grout clean without damaging your shower. Give our friendly team a call on 1300 767 760 today to find out how we can give you the best tile and grout cleaning Melbourne has to offer.